Proudly serving Oswego, Onondaga, Cayuga, Oneida & Jefferson Counties! Great! So you've found your picture perfect home and you are excited to get the ball rolling, what next? Finding a new house is undoubtedly an exciting time! But, between all of the paperwork, finances, and negotiations, it can quickly feel overwhelming. It is my personal goal to make the home inspection process as painless as possible for you, by providing straightforward, timely, and unbiased home inspection reports that you can rely on. The last thing you want is for there to be a "surprise" shortly after committing to one of the biggest financial investments of your life, which is why home inspection reports are so important. One repair can lead to thousands in repair costs. I inspect homes as if I were personally moving in to them, and I go out of my way to inspect your house at or above the minimum requirements set forth by NYS and the International Association of Certified Home Inspectors (InterNACHI). My training paired with my natural sense of curiosity prompt me to detect many home defects in advance (before it's too late!). After inspecting your home, I will immediately discuss with you my findings, highlighting any major defects that may have been detected. Then, I will provide you with a final report-out (digital and/or print) within 24 hours. I am always available to answer questions, so please don't hesitate to contact me. People often wonder why home inspections are so important. In short, I think it is because NYS home inspectors are licensed, trained, and certified to carefully inspect many of the components within a home and advise you on the safety, operation, and condition of each item. We are also able to break down housing defects into 'major' and 'minor' categories, helping you prioritize what is most important. 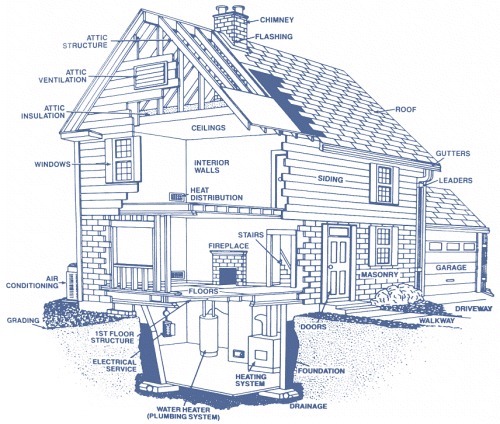 ​The diagram to the right lists out just some of the components we evaluate on every single home inspection.